The Upbeat Dad! : 7 Words That Changed My Life: Daddy, Are You Going to the Airport? 7 Words That Changed My Life: Daddy, Are You Going to the Airport? About 11 years ago, when my daughter was just under 2 years old, I had a contract with a seminar organization that required me to travel extensively. I usually flew out on Sunday and returned home late Thursday or early Friday. I had a vision and passion for speaking and empowering others so this contract was the opportunity of a lifetime. If I made it big on the speaking circuit, then our young family could live our dreams. So in my mind, the temporary sacrifice of always being away from home was well worth it. Then came the day when I did a local seminar in the Miami area. As usual, I got up and got ready to go out. But this time, it was just a drive to the conference center – not air travel. I told my daughter, “Ok, sweetie, I’m going to work now, ok.” Her response was, “Daddy, are you going to the airport?” I told her I wasn’t – just traveling locally. My travels had gotten to the point that my daughter associated my going to work with me going to the airport. Now this might not seem like a big deal. Business travel is just par for the course in many fields. In something like professional athletics, that’s the norm. And in other areas of the business world, it’s to be expected. But for me, a young father in a marriage that had its ups and downs, it was just too much to bear. As I drove to that seminar, I thought of my daughter growing up knowing of me only as a long distance dad. Instead of tucking her in at night, I can only call from a hotel somewhere to say goodnight. I thought about the possibility of the marriage ending and having to try to carve out time in my busy travel schedule for quality time with her. The more I thought about it, the heavier the weight seemed. And the heavier the weight seemed, the closer I came to a conclusion that was previously unthinkable. What conclusion, you ask? The conclusion to put my dreams on hold and be there for my family. I just knew that being a motivational speaker was the direction my life had to take. I had much to share with others and really wanted to make a lasting impact. But then I thought, how can I go out and light the world on fire while at home, my once burning flame is now a dim light, getting dimmer by the minute? Empowering others while my family suffers was just a horrible thought. Somehow I tried to convince myself that if I did enough out there on the speaking circuit, I’d be in such demand that I could afford to have my family travel with me. We could even get a tutor for our daughter so she didn’t have to be in school all the time. But the more I thought about it, the more I knew that the only option was to put that dream on hold and be a husband and father first. Within a couple months, I resigned from that opportunity of a lifetime to get a regular 9 to 5 job in the accounting world. Did I enjoy it? Not at all. But waking up each day at home and being a regular husband and father was worth it to me. As fate would have it, the marriage didn’t quite work out. It lasted just about another year before the horrors of divorce hit our home. I don’t really think that my travels had much to do with the failure of that relationship. Perhaps it helped to reveal the fact that there were some deep issues in the marriage that needed to be addressed. I thought the fact that I quit my traveling position to try to get our family back on track was the right thing. And it was, but as I reflect on it now, at some point, something would have ended that marriage. It was on sinking sand and going nowhere fast. The divorce was rough on me. I wrote about the experience in several posts – including The Story Behind The Upbeat Dad. But as rough as it was, I knew that had I been traveling and doing seminars while dealing with the in and out of court process, I might not have made it through as smoothly. And trying to get a time-sharing schedule with my daughter with a 100% travel position would have been a tough argument to make. Today, I’m fortunate to be happily married to a wonderful woman. We have a 9 month old son. And my little baby girl is now a 12 year old preteen who lights up our home each day. As the Upbeat Dad vision grows, I anticipate that travel will become more and more frequent. But still, I know that, come what may, I will not allow my work to cause me to become a stranger to my kids. Daddy going to the airport is quite fine, as long as all the pieces are in place and the kids know they are top priority. If you’re a parent who has to travel all the time I hope that this post has spoken to your hearts. Our kids need us more than we might know. The little simple things of sitting and playing with them goes a long way. 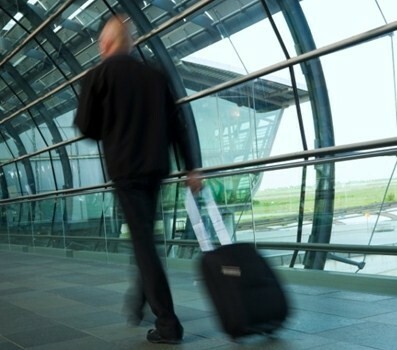 Certainly business travel is to be expected – I’d never recommend simply giving up a job that requires travel. That’s just not practical. 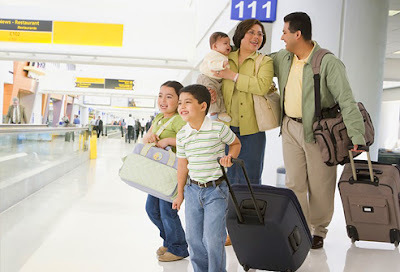 If you must travel, however, you can do so while making your kids and your spouse a top priority. If you’re a frequent traveler, you can build up frequent flyer miles and sometimes they can travel with you. Or if you travel, you can bring them gifts from each city you visit – so they can look forward to that something special. In other words, put measures in place to compensate for your absence from home when you do travel. 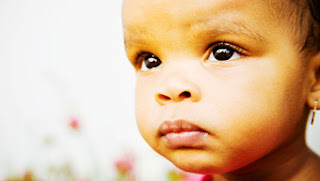 In the post Cats in the Cradle: A Lesson for Working Parents I wrote about the necessity of putting our kids first despite our work obligations. Please read that post for some thoughts on setting our priorities straight while climbing the corporate ladder. My life was changed with my experience about 10 years ago. I hope that this post is a catalyst for other lives to be changed in a positive way. Because when all is said and done, what will we gain if we attain fame and fortune while our families fall apart? Our kids need our time and attention. Let’s ensure that they get the best of us as we give of ourselves to them. This post spoke volumes to me. I am currently on another of my deployments to Iraq as a contractor, doing the job that I am good at and that I want to continue pursuing a career in after learning it in 8 years of military service. My oldest son is five, and doesn't really remember my Army time, but he remembers that daddy leaves for a few months at a time to "stop bad guys from getting on Army bases". I just returned from leave back out here and my son's words the morning I flew back out here haunted me. He woke up in the early morning and was upset that I wasn't in bed and started running all over the house looking for me. He told me, "I thought you left." and he started crying. I am in the process of returning home. This time, for good. My boys need their father home, and I'll make a run of trying to find work stateside that is comparable to what I do here.